For every fan of Diary of a Wimpy Kid, Big Nate, or Timmy Failure--a laugh-out-loud book with a fun mystery to solve! 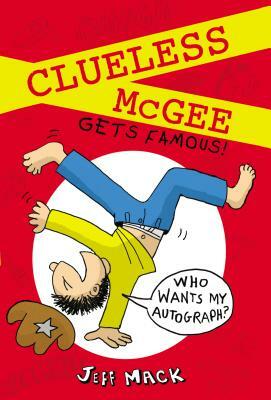 Clueless McGee is confident he is on his way to becoming a famous crime solver. Surely you want his autograph . . . no? Speaking of autographs, when Clueless learns that the messy scribble on the cowboy hat sent by his father is actually the autograph of famous teen idol Junior McFiddle, everyone in school suddenly wants to be Clueless' friend. And they want his hat -- especially the three Taylors, the popular girls who usually do their best to ignore him. When the autographed hat disappears, Clueless sets a trap to catch the thief. As usual, he manages to make a bad situation worse before the thief is unveiled. With abundant humor, a lampooning of teen music sensations and a fun, child-friendly mystery to solve, Jeff Mack has created another book perfect for fans of Big Nate, Diary of a Wimpy Kid, Timmy Failure, or even the Chet Gecko mysteries. Originally from Syracuse, NY, Jeff Mack grew up fascinated by monsters and robots. He built his own pinball machines from cardboard boxes, and created comic books about his four siblings being devoured by monsters. Now at home in Western Massachusetts, he continues to write, paint, and talk with school groups about his various projects. You can visit Jeff Mack at www.JeffMack.com.